I wrote this review up at another web site, but since I wrote it, I am going to include it in my own web site. 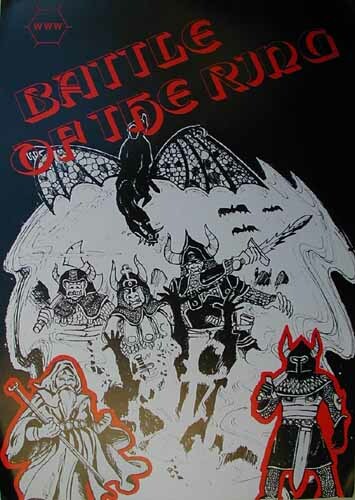 "This is a game for two or three players, designed to simulate the wars illustrated in the book "Lord of the Rings", by J.R.R. Tolkien." "The board covers the area of Middle Earth, and all the major peoples mentioned in the book are included. However, since the literature on this particular war is obviously limited, the emphasis has been placed on speed of play and enjoyment, rather than on attempt to mirror the book. 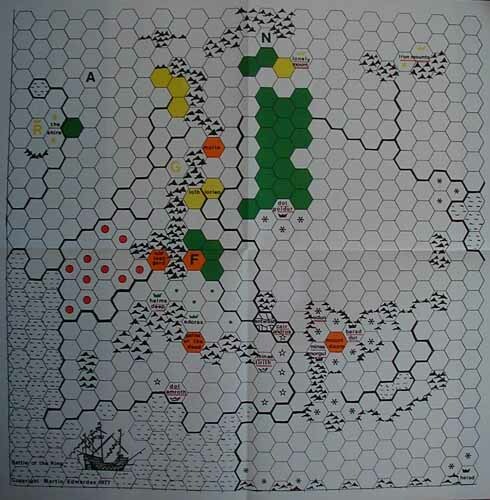 Nevertheless, the game includes the possibility of all the major battles mentioned in the book. A simple live or die combat table is used with no retreats, and zones of control and supply have no part in the game." For the three player game, the players assume the roles of Sauron (orcs), Saruman (man-orcs), and Alliance (all others). For two players, Sauron and Saruman are combined. Set-up is predetermined. Sauron forces set up on asterisks in Mordor and on the east and southern edges of the map, as well as the southern edge of Mirkwood. Saruman sets up on the red dots west of Isengard. The Alliance sets up in various other places around the board marked in yellow. Hobbits start in the Shire, Gandolf in Rivendell, Dwarves in the Iron Mountains, Rohan army in Rohan, and the Gondor army in Gondor, and the Fangorn unit in Fangorn, or course. Stacking is not allowed, except for certain situations like Gandolf or the Ring enters Fangorn and the Fangorn army is present, and a couple of others. Order of Play: For three players, Sauron, then Saruman, them Alliance. For two player, just combine the evil forces. In turn the player conducts the following: Building Army, 1st Movement Phase, Attack Phase, and then 2nd Movement Phase. Building Army: This is the unique feature to this game. Each Army can "build" new armies on the location of the Crown symbol as long as it is not occupied by an enemy army. The Shire is the only location that either the Alliance or the Saruman forces can build armies. Saruman must occupy the Shire before being able to build armies there. At that point, man-orcs would come out of the Shire, until what time the Alliance retakes possession of the Shire. After which the Hobbit army may be built. Gondor can build armies at either Dol Amroth or Minas Tirith. Dwarves may build armies at the Iron Mts or the Lonely Mt. Rohan may build at Rohan or Helm's Deep. Mordor may build at Dol Goldur, Minas Morgal, Barad Dur, or in Harad. If crown is occupied by an enemy, the owner may not build an army there. However, if the crown is left unoccupied by the enemy unit, the owner may start building armies without having to retake the hex. After the first round, the Alliance may build one Dwarfish OR one Hobbit army, one Rohan army and one Gondor army. Saruman may build two Man-Orc armies. Sauron may build one new Orc army in the second round, two new armies in the third round, and three new Orc armies in subsequent rounds. Movement: A player may move as many or as few armies as desired. There are exceptions with the Fangorn and Armies of the Dead. Gondor, Sauron, Dwarves, and Hobbits can move up to two hexes. Man-Orcs, Rohan, Fangorn, and the Ringbearer may move three hexes. Saruman and Aragorn move four. Gandolf and Nazgul can move up to six hexes. There are movement restrictions due to mountains, swamps, etc. An army cannot cross over an enemy army. Elven hexes have special restrictions, as well as Moria, Isengard, Fangorn, Paths of the Dead, and Mount Doom. Attack Phase: There are restrictions as to where armies may or may not engage. Example; Armies may not attack over mountain ranges, or armies in Fangorn or the Paths of the Dead cannot be attacked. When attacking, the player states which pieces are attacking opposing pieces and rolls two die. The Combat Results Table determines the result according to the position of the defending piece (such as open ground, river, fortress). A piece can have one of two strengths, ordinary or Elven. Gandolf, Fangorn, and Nazgul have Elven strength all the time. Some units (Aragorn, Saruman, Gandolf, and Nazgul) can give Elven strength to ordinary armies. Special Hexes: Certain hexes have special features; Moria, Isengard, Fangorn, Paths of the Dead, and Mount Doom. Example, Moria can only be occupied by Gandolf, however, if Gandolf is present in Moria, any Alliance army may pass through. Sauron and Saruman can only pass through when Gandolf is not present. The Ringbearer: The Ringbearer is a special unit and has no attacking or defending strength. However, it can be destroyed (except in Mt Doom), but can change hands several times during the game. To capture the ring, simply move the capturing piece onto the same hex as the Ringbearer, remove both Ringbearer and capturing piece, and place the Ringbearer of the capturing player on the hex. An escape move of three hexes can be made after the capture. * Sauron: Possess the Ring at Barad-Dur. * Saruman: Possess the Ring in Isengard or in the Shire, or for the Saruman piece to occupy the same hex as the Ring. * Alliance: Destroy the Ring in Mount Doom. In the two-person version the "Evil" player must possess the Ring in Barad-Dur in order to win. I have only played this game once as I found it recently on an eBay auction. 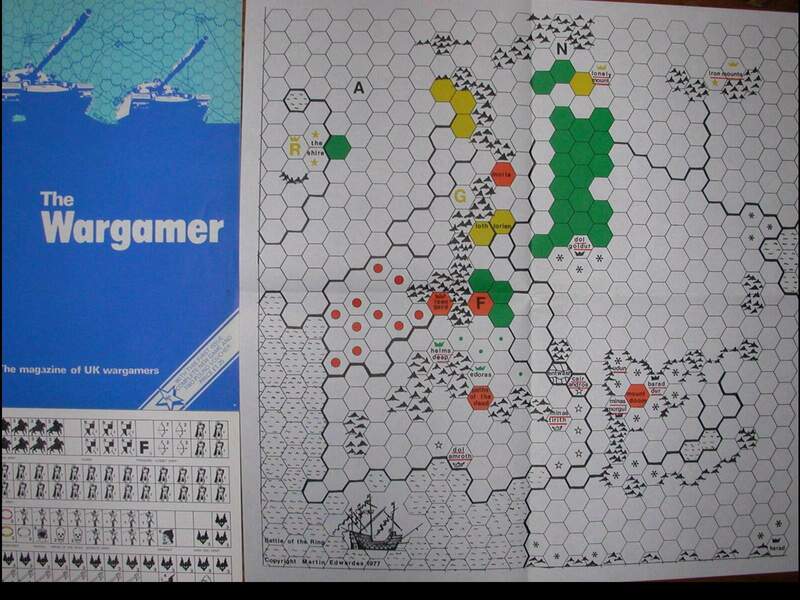 It is a good basic hex-based wargame. While the only ties that it has to Lord of the Rings are the names of the places and characters with the "Ring" options, I still found it enjoyable. I liked the idea of adding to the army with re-enforcements. As the game progresses, Sauron gets more and more re-enforcements making them an overwhelming force. Saruman has the advantage of taking over the Shire army. The Alliance has the advantage of having multiple locations for re-enforcements. The map is a plain simplified version of Middle Earth with most of the known locations present. The map is just on a heavy paper stock and may not take much abuse over a long period of time. There are four colors (red, green, orange, and blue) along with the black borders. Art work is minimal. The counters are just white with black printing with decent figures on each counter. This magazine is hard to find.